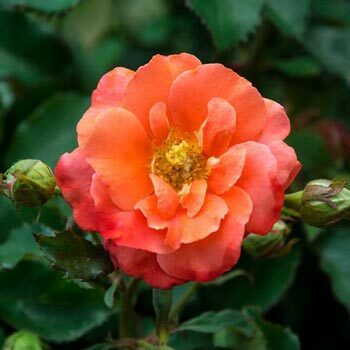 Long-lasting double blooms deepen from a vivid apricot to coral from midsummer to frost. Glossy, dark green foliage on sturdy stems sets the stage for these robust roses. Creates a lovely border, ground cover, specimen or container planting. Perfect for both fresh and dried arrangements. Grows just 18-24" tall. Foliage Type: Glossy, dark green with slightly serrated edges. Flower Form: Double rose blooms approximately 1 3/4" - 2". Planting Instructions: Full sun location is best for bloom production. Soil Requirements: Well drained, organically rich soil. Pruning: Prune to shape, control size or remove spent blooms. All season when necessary. Winter Care: Mulch in northern climates. Additional Information: Spring Hill Exclusive.